Earlier this week I decided to revisit the crochet mistletoe pattern I first posted back in 2011. This new version is pretty similar, but the pairs of leaves are now worked as one piece. I had this wooden wreath on display in the autumn, now stripped of its orange and brown decoration it is the perfect backdrop to my christmas wreath. 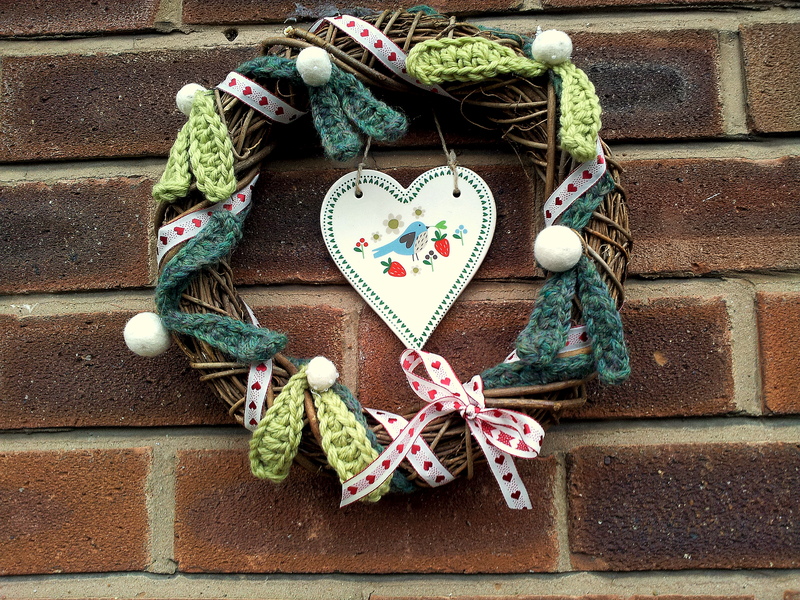 When finished, it will hang over this little ceramic heart by the front door and annoy Mr T – who is not a huge fan of home made decorations – he’s more of a tinsel and streamer kind of guy! The yarns I used are Rowan Pure Wool Aran (held double) and Debbie Bliss Paloma. I used a 5mm hook. 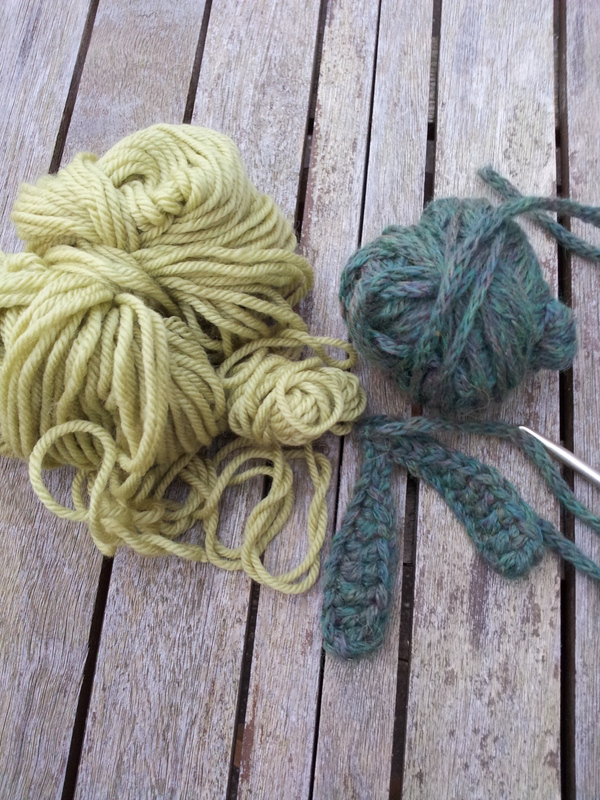 As each pair of leaves use a tiny amount of yarn, root about in your stash for suitable colours and use a slightly smaller hook than usual to make a dense leaf. My wreath is a “work in progress”, but now you have the basic idea I’m sure you could make one and decorate it in your own style! You will need: oddments of green yarn, a crochet hook, small beads or felt balls for berries, needle and cotton, a wreath and some ribbon. Make 11ch, *1 tr in 2nd ch from hook (not a typo), 1 tr in each of next 4 ch, htr in next ch, dc in next ch, 1 sl st in each of next 3 ch**. Do not turn. Make 11ch and repeat from * to **. Finish with a sl st in top of first leaf. Fasten off yarn and weave in ends. 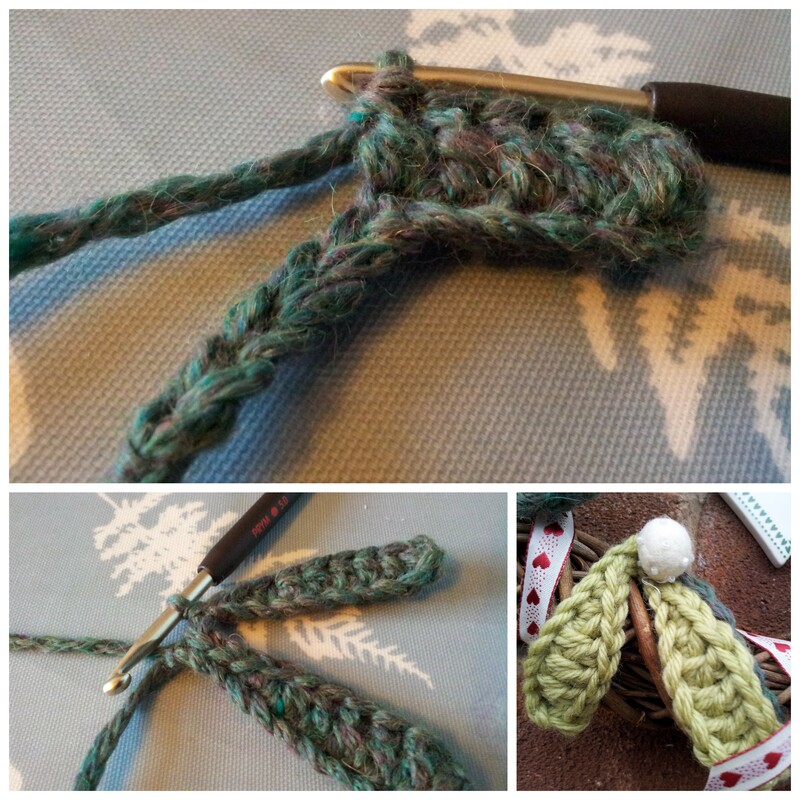 Crochet ribbon: make 100ch, htr in 3rd ch from hook, htr to end, fasten off. (work a second row for a wider ribbon). 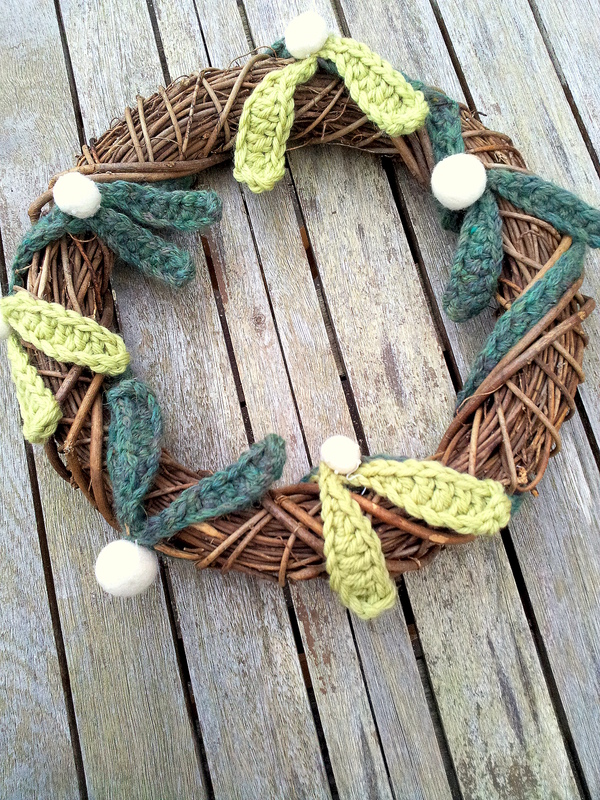 Wrap the crochet ribbon around the wreath. Stitch the leaves in place using a needle and cotton. Sew beads on to represent berries. Decorate with ribbon, holly leaves, baubles as you desire. ps It would be great if you could head over to facebook and click the “like” button on my page, I post lots of crochet stuff there too! Looks really cool Tracey – I used the earlier version of your mistletoe last year – really quick to hook. This looks great – i will have to make some mistletoe this holiday. Thanks for the clear instructions.